- Thursday marks the sixth meeting between Notre Dame and Chicago State and the third consecutive since 2016. The Irish lead the all-time series 5-0. - Notre Dame is 6-0 all-time against current members of the WAC (Western Athletic Conference). - The Cougars finished 3-29 in 2017-18 and 1-13 in the WAC. - First-year head coach Lance Irvin is a Chicago native and Irvin also has 18 years of collegiate experience as an assistant at Southern Ilinois, SMU, Missouri, Texas A&M, Iowa State and Loyola Chicago. He played collegiately at Colorado State and Idaho. - Former Irish football All-American, College Football Hall of Famer, Lombardi Award winner and 1988 National Champion Chris Zorich ('91) is in his first year as the Athletics Director at Chicago State. - Notre Dame connected on 36 of 38 free throws in the season opener with UIC, which is the second-best single-game free throw total of the Brey era (39 vs. DePaul in 2002-03). - The Notre Dame bench combined to score 39 of the team's 84 points in the victory over UIC. Notre Dame (1-0) started the season off on Tuesday night with an 84-67 win over UIC. The Irish didn't shoot the ball well but they made free throws and limited the Flames to just 38% from the field. Chicago State will come to Purcell Pavilion after getting rolled 104-55 at Indiana on Tuesday night. For Notre Dame to get its second win of the year, the Irish will need to shoot better than on Tuesday. The Irish shot just 35% from the field but head coach Mike Brey wasn't overly worried about the low shooting percentage as his team attacked the basket as he hoped. “We have not shot it well from two," stated Brey. "It’s not like we have a low post guy we throw it into. Juwan (Durham) has shot 60% from the floor in 25 practices because he’s around the bucket all the time. Burns and John (Mooney) aren’t drop step guys, although I think John can do that more. I have to help him make some moves and be confident down there. “Our stuff has to be driving it and getting to the foul line. I think we can shoot the three-point shot pretty good and we have some guys that can do that. 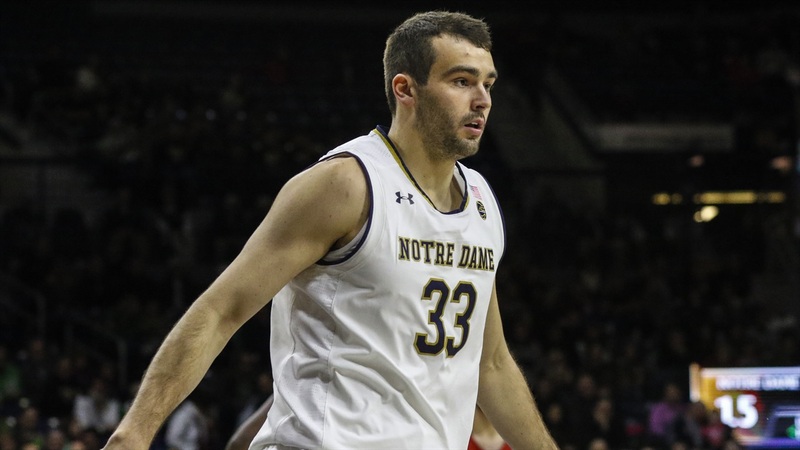 I like how we’re driving it.” Driving to the bucket allowed Notre Dame to almost break a record as they set the second highest free throw total of the Brey era by going 36-for-38. "I thought we would be good, but that’s crazy off the charts," laughed Brey. "I told my boss it’s all because of the new practice facility. We have three extra baskets, and we can shoot more free throws. We’ve always been good from there. I think we can get there more because we’re emphasizing driving the ball. Brey knew he would have to play his freshmen this season and they shined bright. It's clear the freshmen will continue to play big minutes and Brey will continue to ride the hot hand.